As I launch into today’s commitment to “Paleo Light” I am also cleaning out the fridge. This recipe doesn’t exactly meet the specs of my new diet, but the slight amount of dairy I am using is organic so I don’t feel bad about it. Wash and pat dry cod filets, I used a whole fresh filet which I cut into 3 portions. This worked well, as it allowed me to fold the filet in half, creating a pocket for the stuffing. I mixed together the smashed garlic and cream cheese with a bit of salt and pepper. Smear half of the filet with the cream cheese, then add one layer of thinly sliced jalapenos. Fold filet in half (like it’s a taco and the cream cheese is the filling!) 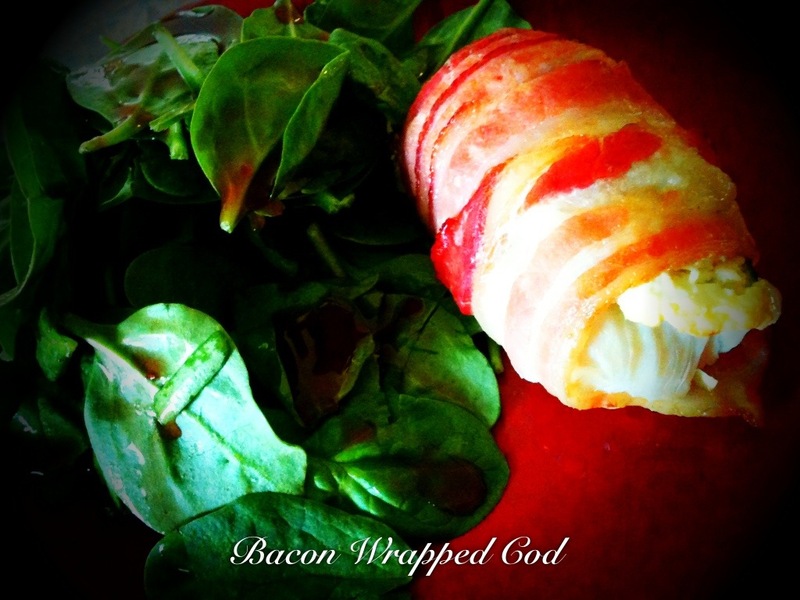 Wrap each packet tightly with two strips of bacon per package. Bake at 350 until bacon is completely cooked. Approximately 40 minutes. Serve with green salad and savor. I’d like to note, that I was concerned that the lengthy cooking time would overcook the fish, however it essentially poaches in the bacon fat (making it succulent and tender!). I used a stone baking dish that has a drip tray, as well. This helped pull away the drippings so they bacon got crispy, not soggy. Hope these tips help.